My Henry is very high maintenance. Even more so than me. He’s a Cavalier King Charles Spaniel, which means he sees his groomer precisely every four weeks, whereas I’m lucky if I can see my hairstylist every eight weeks. During Henry’s last visit, his groomer informed me that she can feel some tension in the back of his neck and that it might be from stress. That I should try to massage his neck and shoulders, on a weekly basis, to help Henry alleviate this stress. 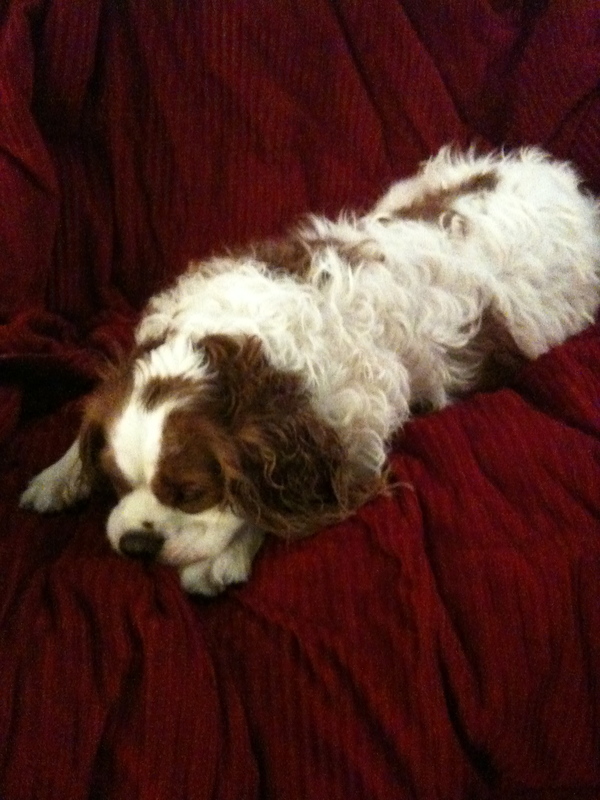 My Cavalier King Charles Spaniel takes a much-needed nap to alleviate his stress. Stress? What is my dog stressed about? I’m the one working day in, day out. I’m the one blogging and trying to figure out what I’m going to write about next. All Henry has to do is decide if he wants to nap on the sofa, the comfy chair that I sit in when I’m watching TV, or simply lounge on one of three dog beds scattered around the home. There’s even a fourth dog bed in the garage that he sometimes likes to use. And there’s always my bed. So, is that the real problem? Have I given him too many choices for napping, that it has turned him into a basket case, simply because he can’t decide? Ear cleaning fluid: I’m supposed to squirt this in his ears twice a week and then rub them. Henry hates this and furiously shakes his head when I apply the solution, causing the liquid to spray all over me. Toothpaste for sensitive teeth: I have to brush his teeth at least once a week. Then, Henry’s supposed to rinse with a medicinal solution, but try as I might, I still can’t get him to gargle and not swallow. Oral gel: This removes plaque from his teeth and freshens his breath (I guess he needs this for when he goes out on dates, thus proving even a dog can get more action than his owner). Problem is, Henry refuses to sit calmly with his mouth wide open so I can apply gel on his canines to my heart’s content. Medicated shampoo for washing his face, to help reduce bacteria from getting into his mouth, which seems pointless, if you ask me. Apparently, Henry’s vet has never seen what this dog puts in his mouth when he’s out for a walk. Bacteria? Henry’s response to that is, bring it on! Well, I guess I have to do all this because Henry is, after all, descended from royalty. His ancestors romped in some of the best palaces of England—Buckingham Palace, Windsor Castle, you name it. While my cavalier is confined to living in my tiny abode. Trust me, my place is no palace. Did I rob Henry of his royal birthright? So, there you have it. I’m living with royalty and all I can say is, who ever said it was a dog’s life? Henry obviously needs a vacation ! …from his his very stressful dog life. Now, I do believe it is true that dogs can mimic or take on some things from their owners … So now Henry has picked up your pinch nerve …and ear wax?! Ohhh Henry! All too pampered! Stressed? No chance! Perhaps your fashionable self is stressing him out, he’s been stuck with the same hair-cut and color for years!! And although he is of royal descent, he grew up with a New Yorker like yourself, so at least he’s not uppity! I had a cat that was an indoor/outdoor cat. He came home one evening and after 2 days of him just laying around the house and not eating, I thought my cat was really sick. I took him to the vet. According to the vet my cat had a few scratches behind his ear so it looked like he lost a fight and was DEPRESSED! Depressed– my cat! It cost me $55 to find out my cat was depressed. Gotta just love our pets! I have heard yoga can do wonders for stress… see Henry do the Sun Salutation? LMAO!! This was funny! For cryin’ out loud, he’s a dog! Get a milk bone for the tartar! Stress? Pffft! If you had a bunch of wild kids running around all day, yeah, I can see him being stressed. Maybe because he’s from royalty, he’s worried about keeping up appearances. Maybe the meeting with the Ambassador to Liechtenstein is keeping him up at night. Stressed. Puuulleease! He is adorable though! Meeting with ambassadors, LOL!! Now I know what he’s doing when I’m not around. And maybe he’s depressed because he hasn’t yet received his invitation to meet with the President at the White House. Being of Royal British blood, he’s awaiting the invite to the Royal Wedding in April. Oh the stress of it all….whoa is him! LOL!! Why of course! He may have sensed that I was hoping for an invite as I was unable to make it to Prince Charles and Diana’s wedding. Why didn’t I see the signs? That is definitely the source of his stress!